Ghana has adopted re-afforestation as one of the main activities for the Nationally Determined Contributions (NDCs) to reduce carbon emissions. To this end, a number of young people are being engaged by government to grow trees in most parts of the country, Mr Peter Abum Sarkodie, Executive Director of the Environmental Protection Agency, (EPA) stated in Accra, on Wednesday. The NDCs, which were at the heart of the 2015 Paris Agreement; represents efforts by each country to reduce national emissions and adapt to the impacts of climate change. It also set out the actions that countries must plan and undertake to achieve the agreement's objectives, focused on limiting the rise in average global temperatures to well below two degree Celsius, and ideally, to 1.5 degree Celsius. Mr Sarkodie stated at a media encounter on the outcomes of the 23rd Session of the United Nations Climate Change Conference (COP 23) held in November 2017, in Bonn, Germany. The EPA Executive Director noted that, negotiations on ways and means of achieving ambitious emission reduction targets of Parties towards a temperature goal of two degree centigrade was the core objective of the Bonn conference. 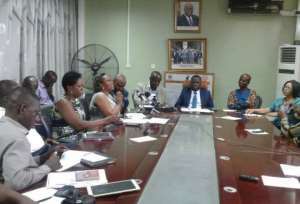 Professor Kwabena Frimpong-Boateng, Minister of Environment, Science, Technology and Innovation as well as Climate Change Experts, Negotiators, Media, and Government Officials constituted Ghana's delegation. Mr Sarkodie, who was also at the COP23, noted that, the Bonn conference, among other things, also sought to implement the call for climate change action that was adopted by the parties during the COP22 in Marrakesh Morocco. On the outcomes of COP23, he said the 192 parties to the Agreement approved the taking into consideration the special circumstance of all developing countries in the implementation of the Paris Agreement. The Parties also agreed to implement the NDCs and enhance south-south cooperation purposely to share experiences and best practices and called for the strengthening of the Warsaw International mechanism on loss and damage. The African Group of Negotiators expressed concern about the lack of pre-2020 action, noting that, only eight per cent had ratified the Doha amendment. Mr Sarkodie said there was the need for Ghana to increase high-level negotiations to attract climate change funds that would help finance adaption projects. He urged the media to play a critical role in helping to educate the public on the need to reduce global emissions and save the environment from the effect of climate change. Mr Kyekyeku Yaw Oppong Boadi, National Focal Person on Climate Change said Ghana's team, which was part of the African Group of Negotiators, negotiated on issues of adaption, mitigation, agriculture, response measures, finance, and on loss and damage. He said the country was also working at linking its NDCs to the Sustainable Development Goals as a holistic approach to climate change adaptation. Mr Antwi-Boasiako Amoah, a Principal Programme Officer at EPA in charge of Climate Vulnerability and Adaptation said, as part of implementation of the NDCs, the agency was engaging the assemblies through the MMDAs in capacity building programmes on climate change issues to enable them to help in the implementation of the NDCs at the grass-root level. Dr Raymond Kasei, Lecturer at Regional Institute of Population Studies (RIPS), University of Ghana, said Government's 'One Village One Dam programme,' and the 'Planting for Food and Jobs,' should be adopted as critical NDCs.